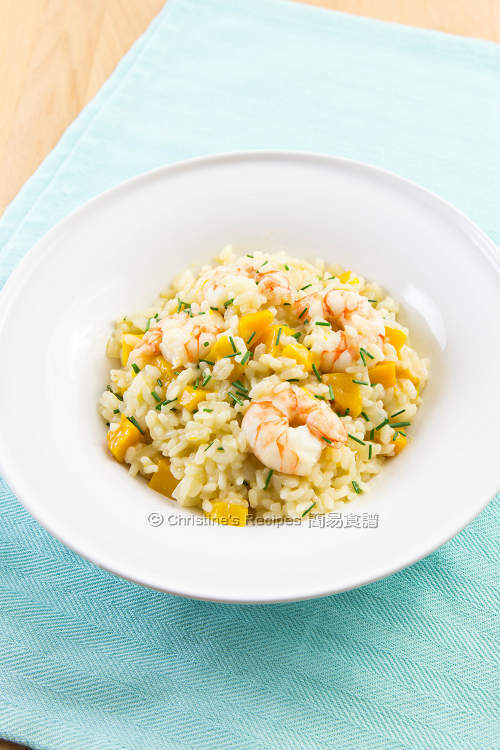 What I love risotto is its fantastic taste because the rice is cooked with yummy stock. 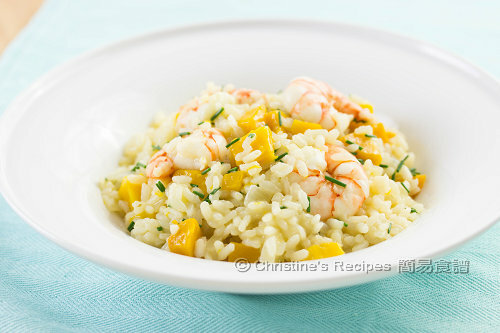 To make risotto is pretty straight forward and simple. It only requires me a bit more of patience to stir the rice constantly during cooking. Pumpkin is really a wonderful produce that can pair up with many other foods beautifully. 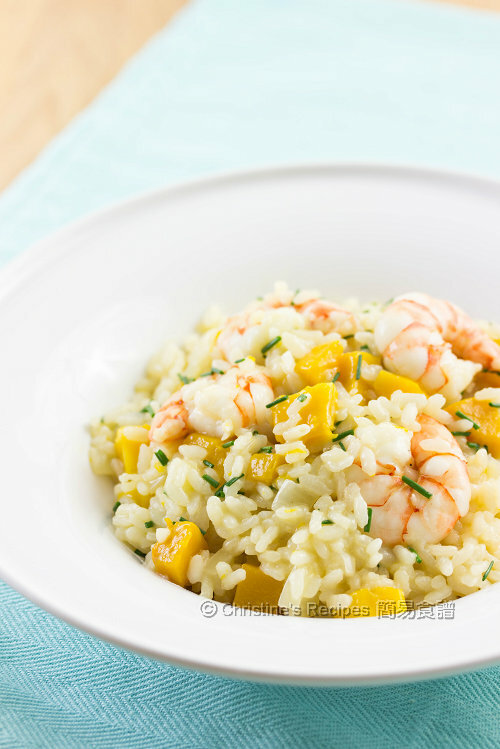 This risotto dish tastes even better by adding a small portion of a large pumpkin with some prawns. Use a saucepan to heat the stock over medium heat. Once it nearly boils, reduce heat and keep warm at low heat. Season the prawns with salt and pepper. Set aside. Heat butter in a frying pan until melted. Saute the onion. 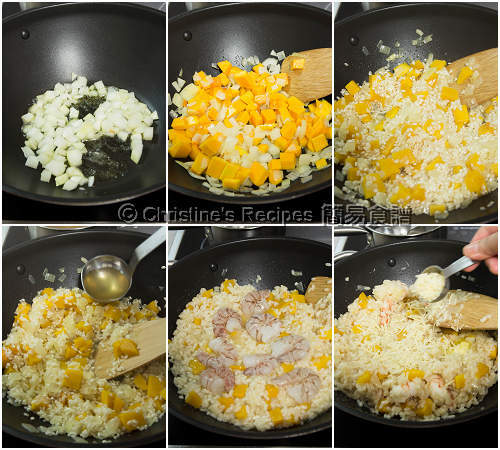 Add pumpkin and continue to cook until the onion turns translucent, about 4 minutes. Add rice. Pour in the white wine. Stir constantly and cook until the wine is evaporated over medium heat. Ladle enough stock to barely cover the rice. Cook with constant stirring until the rice absorb all the stock. Add a little more of the stock at a time and keep stirring while cooking, until the rice is cooked through with a tender texture but still firm to the bite, about 20 minutes. During the last 5 minutes, add the prawns. Stir to combine and cook until the prawns are just cooked through. Stir in some more butter if desired. Sprinkle the cheese and combine well. The rice should be creamy at this stage. Season with salt if needed. Serve immediately. 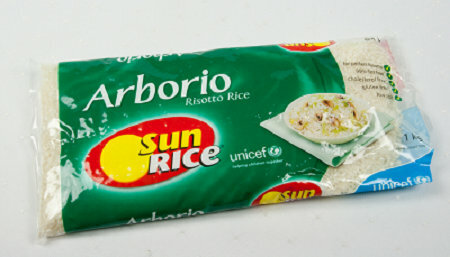 Arborio rice is available at supermarkets. You may use short grain rice instead. It will work too. One of my favourite Italian classics. Yours look great with those succulent prawns. Hi, i don't have white wine at home. What will be the substitute? Thanks!